Results, even when simply The Way to Happiness is employed, are nothing short of phenomenal. In what amounted to a case study of juvenile offenders in Butler County, Alabama, then juvenile court director and chief probation officer Daniel O. Black had previously reported an eighty percent recidivism rate among paroled or probationed youths. The problem, as Black explained it, "A pair of Nike tennis shoes actually had more value than someone elses life for many of these kids. So it became very apparent that we wouldnt get anywhere unless we could find some way to readjust those values to ones which were more appropriate for society." 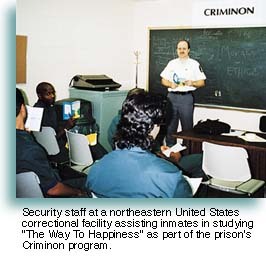 In what he then described as an experimental program, copies of the booklet were distributed to inmates or read to them aloud. The youths were then encouraged to find ways in which the precepts might be applied and, when literacy levels permitted, to compose an essay on each precept. "I could pretend it to be more complex," Black confessed, "but it really is quite simple. I help them with the definition of words they dont understand, and otherwise continue to encourage that all-important point of application." Whereupon, as he just as simply put it, "Results became spectacular." By way of figures, Black went on to report that while Butler County crime rates had been previously escalating on par with national averages through 1990, the five years since his introduction of The Way to Happiness have actually seen a decrease in crime. Moreover, and even more spectacularly, that eighty percent recidivism rate suddenly, and most remarkably, fell to but ten percent. To what has become a largely hopeless field  with only two percent of correctional budgets now earmarked for treatment and wardens routinely admitting they can only pass the problem of rehabilitation on to the probation officer  that figure becomes immensely significant . . . And all the more so when one recognizes that such success is not exclusive to Butler County. "Dramatic," is how yet another juvenile officer described results from the Criminon program at a Los Angeles detention center, and cited a marked lessening of hostility, increased willingness to communicate and, "extraordinarily, they now feel remorse for what they have done in the past." "The Way to Happiness gives you the outcome of your actions. You understand the outcome of what you do. Its for you. It teaches you the Golden Rule. I used to hear about it, but this puts it into perspective. I know what it means now. 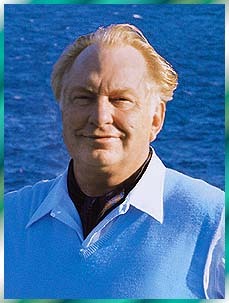 "I dont know who this L. Ron Hubbard is, but he is one smart man. If people would just listen to this book, The Way to Happiness, the mass of the people, if they would just understand it, take it, think about it, then the world would be a different place." Criminon activities around the planet.